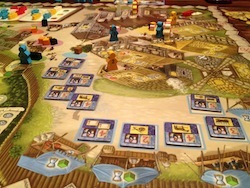 Village is a game that has been a big hit with fans of the “Euro-game”, which generally means games that have low direct conflict, focus on wise gathering and use of resources, and tend to have themes set in the middle ages or sometime before the modern period. When I got into the board-gaming hobby as an adult, I was immediately drawn to Euro-games and wanted to try them all. After a while, I began to see that many of them were rather similar, and games like Agricola were the exception rather than the rule when it came to excellent Euro-games. These days, I still enjoy a good Euro, but my collection does not consist of them for the very reason that many of them are essentially similar. 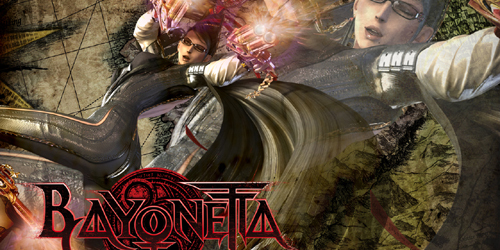 This game builds upon the explosion of these games in the last several years, and offers long-time Euro-lovers some interesting twists, while possibly giving gamers with other tastes something to latch onto as well. Let’s take a look. You see, when a family member dies, they go one of two places: the Book of Records or into an anonymous grave. So, basically, they end up being important and remembered or a nobody and forgotten. You want to have family members that are important and remembered. You don’t just die and go in the book though, that would be too easy. The family member gets a place in the book according to the occupation they held in life. There are five sections of the book: one each for farmers, council members, church members, craftsmen, and travelers. Each section has a certain amount of space in it according to the number of players. Once a section is full, no more dead family members can be recorded in that part of the book and they must go in the anonymous graves. The game ends when either the entire book or the anonymous graves are full. Interesting? I think so. So you have your family members on your player board. What do you do with them? When the game starts and at the beginning of each round, the board is seeded with five different types of cubes, with a varying number placed on each action space according to how many players there are. The cubes are classic for a Euro-game, and in Village they were meant to be more thematic, but somehow ended up just being more cubes. Let me explain: the cubes are supposed to represent not goods, but qualities. These qualities are things like “faith” (brown cubes) and “persuasiveness” (green cubes), with the black cubes representing the effects of The Plague. It would be great if I thought of these whenever I was taking/using a cube, but it just ends up being about having the colors you want when you want them. You’ll hear “I’m going to spend two greens on the Council action” ten times before you’ll hear “I’m going to use my persuasiveness to advance further in the Council,” if you hear something like the latter at all. These cubes are placed onto the action spaces on the board, which are things like the council hall, the craft buildings, the market, traveling, family, and a few others. On your turn, you take a cube from an action space and then decide whether or not you want to take that action. If you take a black (Plague!) cube, you have to advance your time track two spaces. Many of the actions require you to place one of your family members on a building, where they are considered to have taken up that building’s purpose as an occupation. For example, if you take a cube from the craft buildings space, you can place a family member on the wainwright’s shop where they can become a wagon-maker (necessary for traveling), or on another building where they can become a scribe and start making scrolls (a resource in the game). If you take the Church action you can pay either faith cubes or time to place them into a black bag where you might hope they are drawn out during the mass that is held at the end of each round. If you put your first-generation family members onto buildings, chances are they will start dropping like flies when your time track goes around, so you are often deciding whether you want to put a younger family member onto a space to be able to utilize that action more efficiently, or placing a first-generation on it and accepting that they may die soon. So, that is why this section is titled the way it is: because the first generation can seem to die so quickly that it feels like they started out in middle-age or older. Let me explain something about the craft buildings. When you place someone on a craft building, you “train” them in that profession by spending a certain amount of time (two or three). Once when you train them in future craft actions, you can then spend more time to craft whatever good their profession turns out. For instance, I can place a person on the blacksmith’s building, which makes him a blacksmith and costs two time. Right now and in future craft actions, I can then spend two time to get a plow. So, for an initial investment of two time, I now have a craftsman that can spend two time to make a plow whenever I take a craft action in the future (until he dies of course). 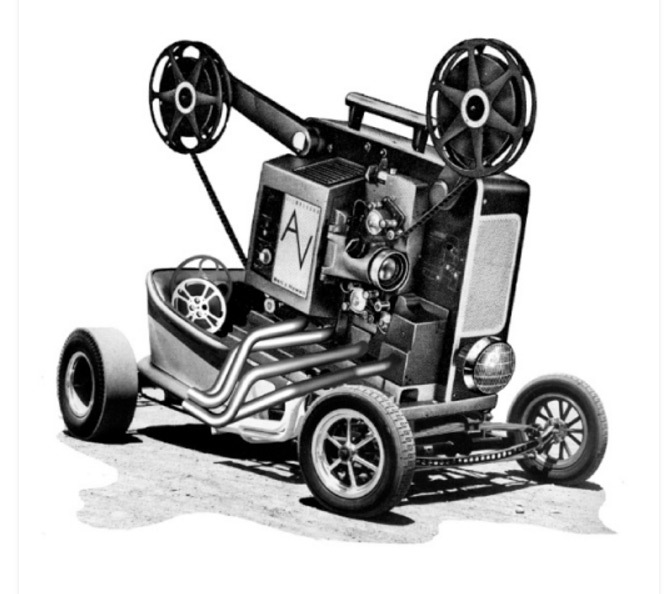 Turn Euros Around…Does That Make It Better? It’s hard to know this from the basic information I’ve given in this review so far, but Village is obviously trying to buck some standard Euro trends. The resource-gathering has been turned inside-out, so that players get cubes to take actions, instead of the other way around. Players use workers to get resources, but only as placeholders. The way to resources or goods is often to spend time, and the “shortcut” way is to spend cubes. Grain, while present, is not necessarily a central, all-purpose resource. It is used for specific, thematic purposes: giving to the church, or cultivating horses and oxen, or making money. There is one big part of the game I have not discussed yet: the market. There is ever only one cube on the market space, so generally it happens only once per round. 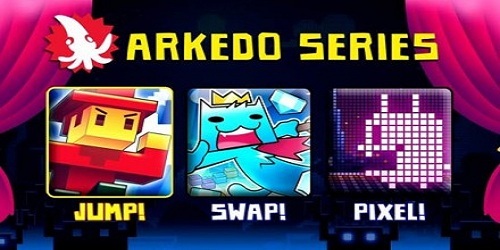 When a player takes the market action, a “market day” occurs where players can sell goods to various customers represented by tiles drawn randomly from a stack. 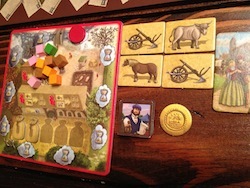 Customers want one or more goods in varying combinations, and if a player sells their goods to that customer, they take the customer tile and place it face down next to their player board, to be added to their score at the end of the game. The market has the possibility to be very lucrative, and is an interesting alternative to the long-term investments of the church and council. The market also makes you choose whether or not to keep goods that may aid you in future turns (like selling your ox and cart which can get you four grain with a harvest action). Alright, so I hope I’ve given you a taste of what the game is like, though it is hard to grasp it all without sitting in front of the board and seeing everything laid out in front of you. Village is still a Euro, but I feel that enough twists have been added here to make it stand out amongst any other Euro. 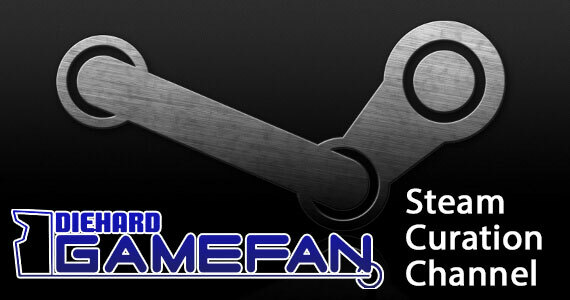 A concerted effort has been made to make the game different, but familiar. The one place where the game does feel quite odd is with the timing. The games I have played generally last from three to five rounds (a round ends when the last cube has been taken from the board), and usually the entirety of the first generation passes away for each player (more with only two players). The rate of death coupled with the fact that once players see the book filling up they are more likely to try and get their people dead and in it before the game ends causes a rather sharp and sudden ending. You can feel like you are just getting your younger generation into place, or you are just starting to get things rolling when the end comes. Interesting connection to the theme, that. 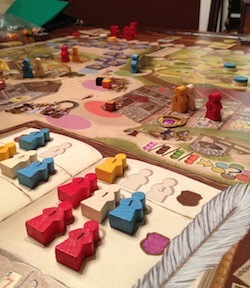 In a two-player game, there is a bit more room and time for planning, but in a four-player game time is definitely tight. Since it feels like a Euro, you feel like you’re going to have time to build up and execute a strategy, but really your strategy has to take less time or accomplish less, since the game will end before you feel like you have done all you wanted to do. Some other concerns I have is that the council and the church feel like really tough places to get a younger person on and advance them high enough to score meaningful points. Since there are so few cubes available on the council, if another player has their eyes on the council you are both stuck with a tiny amount of actions and very few, if any, of your pieces will end up in the highest scoring position. The church is more forgiving (heh), but still tough to advance for younger generations. 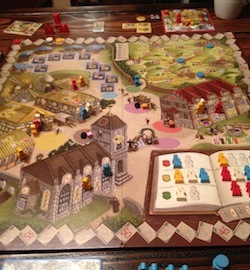 If the younger persons are difficult to advance, and the older persons die before the end of the game when the council and church are scored, it creates a real strategic conundrum to get your pieces into those scoring positions; those parts of the game where progress feels so slow can be frustrating. Preparing to take a future action and then being thwarted by another player taking the last cube for that space is also common, but there is a very expensive way out in the form of the “wishing well” space, where you spend three cubes of the same color to take any action on the board. I would definitely recommend Village to any fan of Euro games, or indeed any gamer who might enjoy the challenging gameplay. Make no mistake, this may have a gentle theme but it is *not* an easy game to master. Thinkers will enjoy this, but those prone to “analysis paralysis” may find themselves agonizing each turn over what to do. Nothing seems like a sure thing, but everything has the possibility of benefits… the choices are difficult. Younger players might be baffled, and those not enjoying complexity might also not enjoy Village. Otherwise, I heartily recommend adding it to your collection and experiencing the joy of naming your people, and then saying a short eulogy when they pass on. 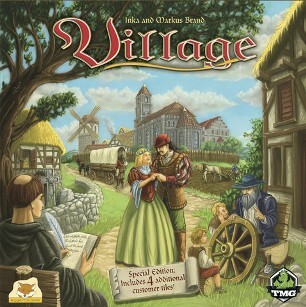 Also be on the lookout for Village Inn, an expansion that adds an inn and a brewery to the mix, as well as some new resources and a revamped record book, coming in 2013!